Ballpark Basics: A ballpark that takes a team from worst to first. 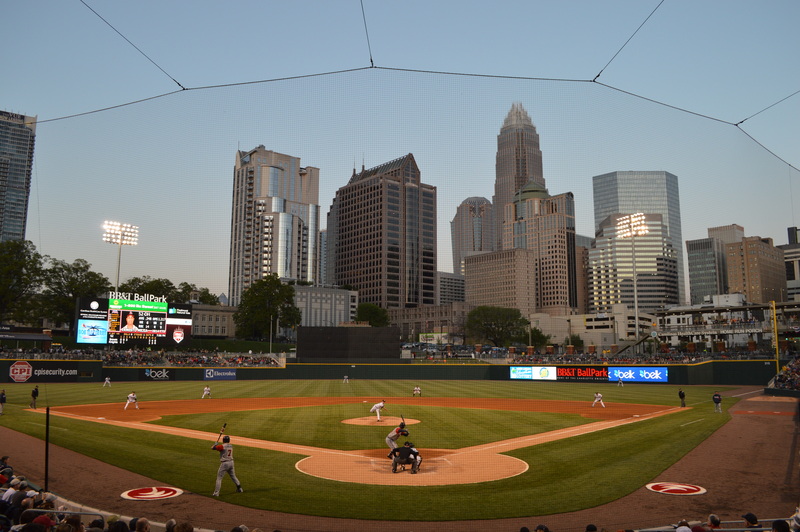 Ballpark Breakdown: When we visited Charlotte two years ago we were surprised that we had to travel over 20 miles and into another state to watch their “local” team play. The city had built its downtown up at an astonishing pace over the past two decades but due to various politically motivated debates, had not yet been able to include a ballpark in the construction plan. 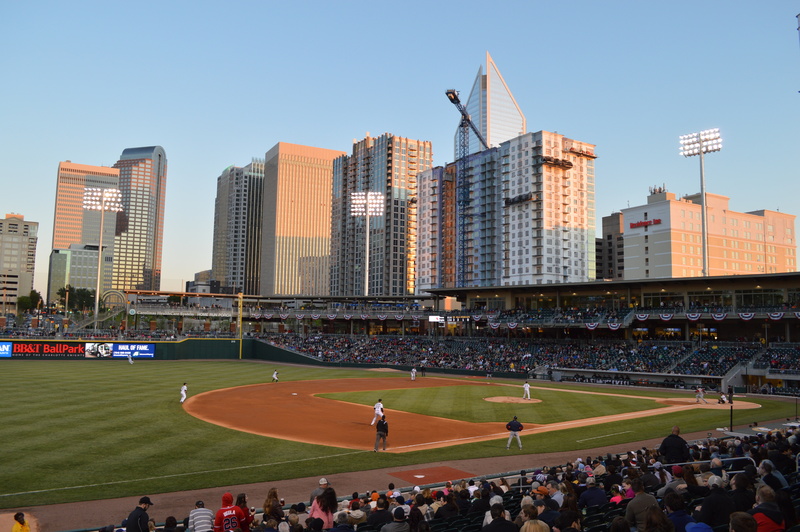 Happily, issues were resolved and the Charlotte Knights opened their 2014 season in their brand new BB&T Park, centrally located in the Uptown neighborhood of downtown Charlotte. 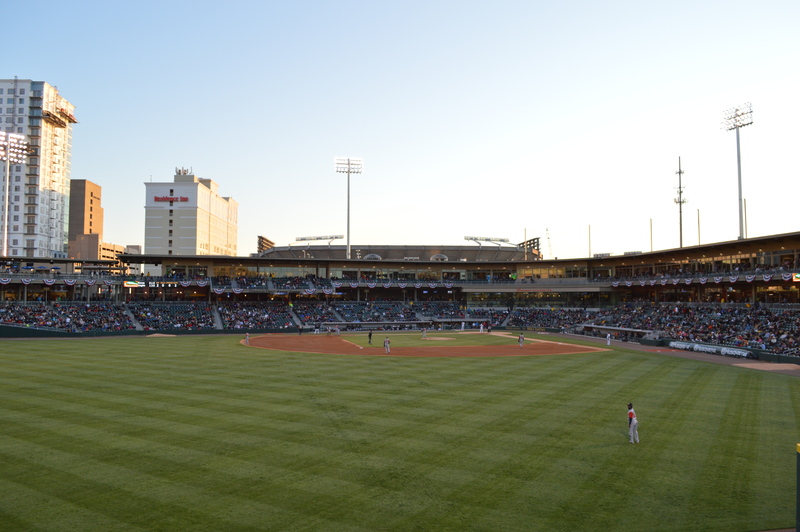 The excitement over the new ballpark is evident as soon as you pull into town; everyone that we talked to a each of the breweries we visited had already been to the park or had a plan to get in a game within the week. Because of this, the Knights were able to sell out their entire opening weekend. We were there the week following, and were lucky to have a chance to meet with some of their staff, one of whom was able to find us two seats for their second ever homestand. Arriving at the park, it’s easy to see what the excitement is about. Besides the obvious allure of a flashy, clean and brand-spankin’-new local park, the very first thing you really notice is the backdrop. We have taken in games with backdrops including mountain ranges, on lake shores and beaches, in iconic and historic parks. 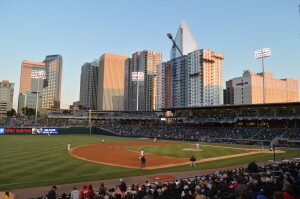 We have even been to other ballparks that like Charlotte come with a city skyline view; one would be hard-pressed to find a more dramatic view than the one at BB&T Ballpark, where the skyscrapers appear to be growing out of the outfield wall. Interestingly enough, one of the reasons that it took so long for the Knights to finally get their new home was due to one man: Jerry Reese, a local lawyer was (and still is) against the Knights building a AAA ballpark in favor of trying to lure a MLB team to the area. In fact their previous park was built in the hopes of expanding to be able to host a major league team. 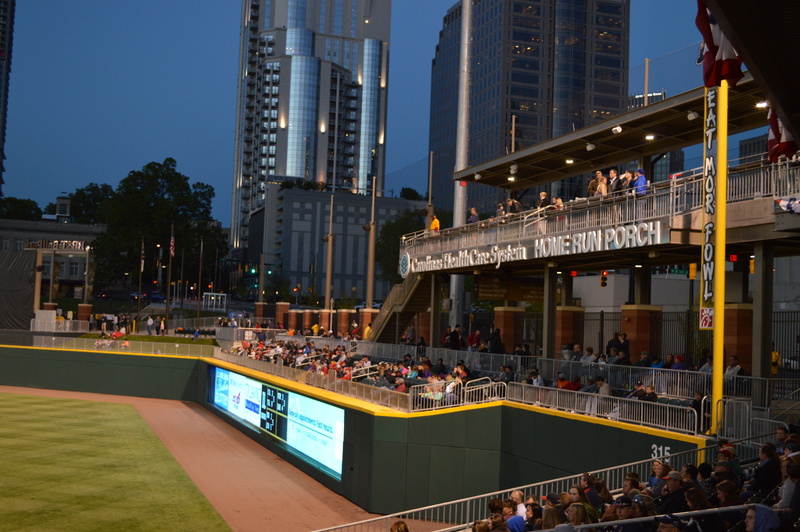 You won’t make that mistake with BB&T Ballpark. 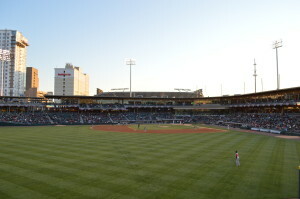 With only 10,000 seats the Knights have one of the most intimate ballparks in all of AAA baseball. It is so compact that it is hard to imagine that they squeezed it into a city block. However, when you walk around you do not feel cramped at all. The seating bowl is nice and wide. The concourse has plenty of room and has clear views all the way around the park so you can watch the game as you get up to get your concessions. The concourse does narrow a bit coming down the right field corner. Here there are still plenty of seats, but no concessions and the walkway thins to accommodate the footprint of the land available. But along the lines of “open with clear visibility” in this same spot the fencing is spaced wide enough to allow fans to see the field from outside the stadium (there are actually a couple other spots where you can catch the game for free as well – from the sidewalk beyond the outfield and even the fire escape exits from the neighboring Marriott. Even in the cold, we saw fans taking in a couple of innings while they walked past the park. We are sure this was a popular feature during the opening weekend and will continue to increase in popularity as the season progresses. Another benefit of opening a new park is that you can start from scratch and incorporate current trends. While many ballparks seem to be hampered by out of date beer distribution contracts, the Knights were able to embrace the craft beer craze. Here’s a brief walking tour of the beverage options starting from what appears to be the main entrance on the first base side, to your immediate right is a concession stand named “Beers of the World” with some craft options. The first beer stand is just left of here, it’s dedicated to Foothills Brewery and had a consistently long line each time we passed by. As you continue on around the concourse there is another cart for Natty Greene’s Brewery – a local favorite (and a favorite of ours as well. We paired them with Greensboro, their founding city) and yet another cart with options from Sam Adams. 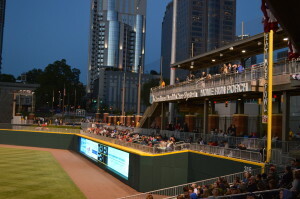 Olde Mecklenburg Brewery has a beer hut in the left field corner. NoDa Brewery even created a new beer just for the Knights, aptly titled A Knights Ale, an IPA brewed with Amarillo, Warrior, Summit, and Centennial hops (see our review below). While there were lots of ads promoting the Knights Ale,it was actually one of the more difficult beers to find at the park since NoDa did not have a dedicated beer stand. One of the more unique options for your beers were the large mason jars that they severed the beer in. Carolina is such a craft beer state, and from our travels, there does seem to be a solid chunk of the population making a shift to supporting, promoting, and even preferring these craft options; so it is wonderful to see teams include multiple options for the thirsty fans. Groups will not have any issues finding a place to watch the game here either. Behind the left field wall you will find the PNG Picnic Area. You can rent this place out and even have your event catered. Behind home plate is the Budweiser Home Plate Club. With one of the best views of the ballpark and an air conditioned (or in the case of our visit, heated) suite this is another great option. However, one of the most unique aspects of the ballpark is the Dugout Suites. Located between home plate and the Knights’ dugout, the seats actually put you closer to the batter than the pitcher. A cheaper option is the berm seating behind the left field concourse. A huge hill allows you to bring out a blanket and spread out as you enjoy the game. Yet another option was to stand behind the seating bowl. Here you will find a small shelf to place your food or drinks while you watch the game. As soon as we saw pictures of the ballpark under construction we knew we had to make a trip back to Charlotte. 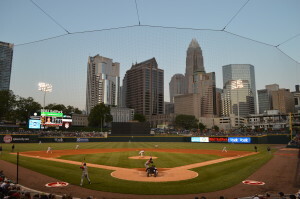 We were lucky enough to make it during the opening week and see what a gorgeous ballpark they have in the Queen City. It is sure to make a number of “Best Of” lists this year so make sure to put it on your list. *As mentioned, the first time we visited the Knights, we caught a game in their former stadium. If you’re interested, you can still read our old review, here. Brew Basics: Follow the trail of locals to find this hidden gem. As with many upstart breweries of our day, NoDa is nestled in an industrial section of their hometown. 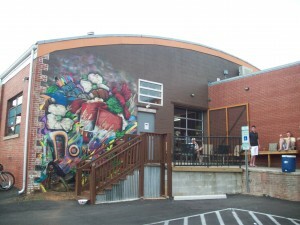 You can find them (and several others) in the North Davidson, or NoDa section of Charlotte, NC. Poured concrete aside, NoDa has done a great job making their slab feel homey. You’re greeted by an outside porch, complete with umbrellas and a dog bed, cool one-legged benches that are attached to what used to be a loading ramp, a BBQ grill rarin’ to go, and music. Up the ramp and through the garage bay doors leads you to an open room with rectangle windows, a wooden roof, hanging fans and lights, and most likely – a bar full of people. 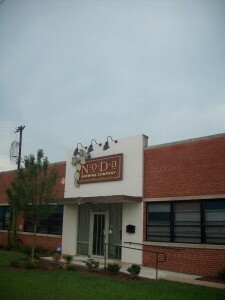 Hipsters, bikers, frat brothers, couples and tourists alike all seem to find something to like at NoDa. There are beer books and local art for your perusing, and a chill atmosphere where the Southern friendliness (sometimes seen outside of the south as Southerners who just “to talk to anyone”) is on full display. They also have a lot going on outside of BBQs and bands, on display that day were flyers for their Brewers Ball, and a BYO Craft Night – a creative and unusual concept for a place that relies on beer sales to stay in business. Since our first visit the number of breweries has expanded extensively, but so has the popularity of NoDa. Still the number one brewery in Charlotte, they’ve started canning two of their beers, Jam Session, a pale ale and Hop Drop n’ Roll, their much beloved IPA. 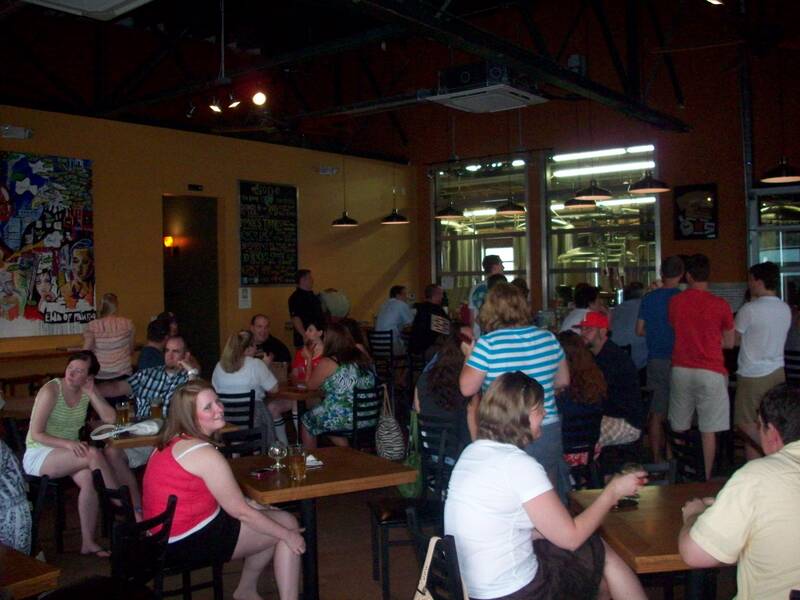 Our 2014 trip occurred just days after the World Beer Cup award winners were announced, and we thoroughly enjoyed being part of the celebration as NoDa had entered on almost a whim and come out with Gold. It was the talk of the town. Top that off with their monumentally popular runner’s club, which gathers in the parking lot to go 1,3, or 5 miles after work the place was hoppin’ even on a Wednesday evening. There’s a lot of good things happening here, and a lot more in store for their future. Keep an ear to the ground on NoDa. Ghost Hop White IPA (5.9 ABV / 70 IBU) – Hazy but bright yellow color with lightly visible carbonation. Aroma of fruit, like green grapes. The German yeast strains hit your tongue first imparting their banana like flavor and then the Ghost Hop finishes wheaty. This white IPA style is an interesting mix of a Belgian wit (sweet upfont) and IPA hop end and is more complex than your typical warm weather porch drinker. 10 Blocks South (5.5 ABV/ 56 IBU) – 10 Blocks South is an extra pale ale that is light brown in color with orange tinges. The nose contains a a bit of caramel malts, but doesn’t have a ton of aroma so at first you might not be sure what you’re getting into. And like the aroma, smooth and subtle at first it develops almost a nutty character and the hops become more pronounced by the end. Overall a consistent beer, despite this slight hop build. Ramble on Red (5.2 ABV/28 IBU) – While this beer pours just a shade more coppery than the 10 Blocks, the aroma is much more pronounced, and very sugary. This is deceptive because the flavor is actually much more bitter than the aroma lets on that culminates with a dry, woody finish. All of the NoDa beers have been just lightly carbonated, but this is the tingliest so far. Coco Loco Chocolate Porter (6.2 ABV/40 IBU) – Just read the name of this one again. Go ahead, I’ll wait. A chocolate brown beer that smells exactly as something like this should; of roasted coffee and chocolate malts. Gillian won a bet on this one with the coco in the name being a reference to coconut and not chocolate, which is roasted onsite (the coconut that is). This chocolate brown porter pours with very little lacing and a coffee aroma. The palate starts lightly but builds to a robust malty finish. It’s one of the best beers NoDa produces, and we can’t wait till they start sending this one down the canning line. 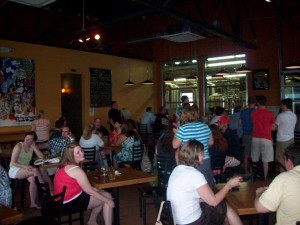 Monks Trunks (5.6 ABV/20 IBU) – Listed as a Belgian style Pale Ale, this beer was definitely more Belgian than pale ale. Although it might not be quite as fruity as a straight Belgian, this one had plenty of banana and not a hint of bitterness. It was still quite full bodied and gave you just a hint of a hop bite at the end of your sip. It poured a hazy golden-brown and although hard to describe it tastes better than it sounds, and is worth trying. Nodaryez’d (8.65 ABV/94 IBU) – A light bouquet whose color was orangey-brown and again just a bit hazy. Nodarye’z is a rye imperial IPA, and one we were prepared not to like. In the sip, the first taste that hits you is a strong sour rye that quickly becomes a complex hoppy taste. Highest carbonation of any of the NoDa beers we experienced, that was fully bodied and surprisingly good. Haulin’ Oats (5.9 ABV/50 IBU)- Smells like grass and a field – tastes like it too, More specifically, this crisp, clear yellow beer can stand on its own it’s not carbonated too strongly, and very springy with lemon grass and oat notes. Midnight Madness (6.75 ABV/71 IBU) – Midnight Madness is a dark porter colored beer, which does make sense seeing as it’s a Cascadian dark porter built with a recipe whose backbone is 6 varieties of hops. Nutty front, hoppy end, with some chocolate nibs in the back. We’ve been seeing more and more dark IPAs on store shelves lately, and NoDa’s addition to this category is a strong entry. A Knights Ale IPA (5.9 ABV/58 IBU)- Golden yellow with a lasting white head, the Knight’s Ale is specially brewed for the home team Charlotte Knights. Aside from a cool logo, this beer is nothing other than a solid IPA. It’s hoppy, with no twists or punches to the palate, just straight up grains, malts and hops. It even smells a bit like that vaugely wet wheat smell that hangs in the air of a brewery.